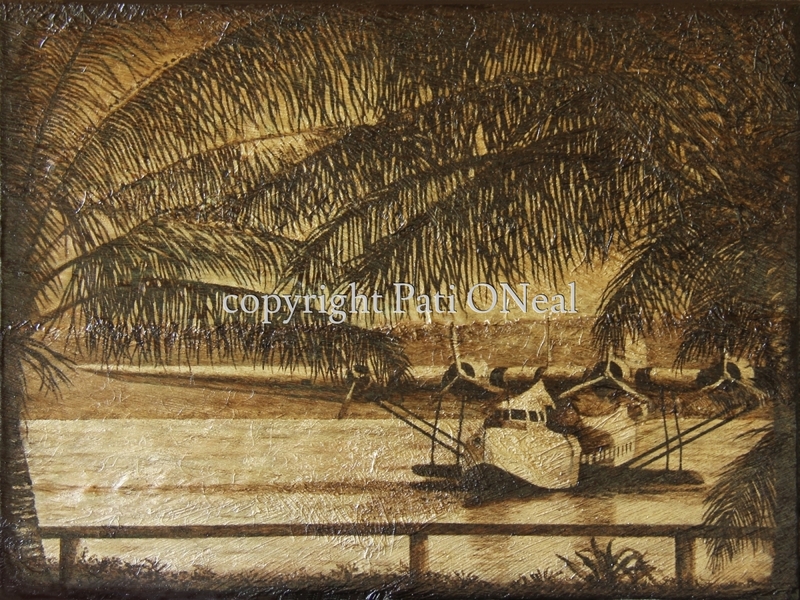 This painting done on actual coconut tree fiber depicts a Martin M-130 coming into dock beneath the fronds of tropical coconut palms. This aircraft was better known as the China Clipper, the Hawaii Clipper and the Philippine Clipper during the Golden Age of Aviation. With the advent of their flights, the dream of exotic locales became known to the masses and a reality to a chosen few. These Clippers and their travels are still looked upon as the true essence of the romance of flight. "Coconut Clipper" received two awards in the juried 2013 ASAA International Aerospace Art Exhibition in Baltimore, MD and is currently available. Contact artist for purchase or a similar commission.